During the recent IDEF 2015, the Defence exhibiton in Istanbul, the Turkish Shipyard SEDEF had signed a contract with the SSM for the design and construction of one LPD Ship for the Turkish Navy. Navantia participates in this contract as a technological partner. Navantia will provide the design, Transfer of Technology (ToT), equipments and technical assistance to SEDEF for local construction. The design, based on the Landing Helicopter Dock (LHD) "Juan Carlos I" for the Spanish Navy, is adapted to the Turkish Navy requirements, having the advantage of being a tested ship with excellent performance since commissioning. Navantia will also provide several components and systems, as the engines and the IPMS (Integrated Platform Management System). The selection of the design was announced on 27th December 2013 and the commissioning of the ship is scheduled for 2021. 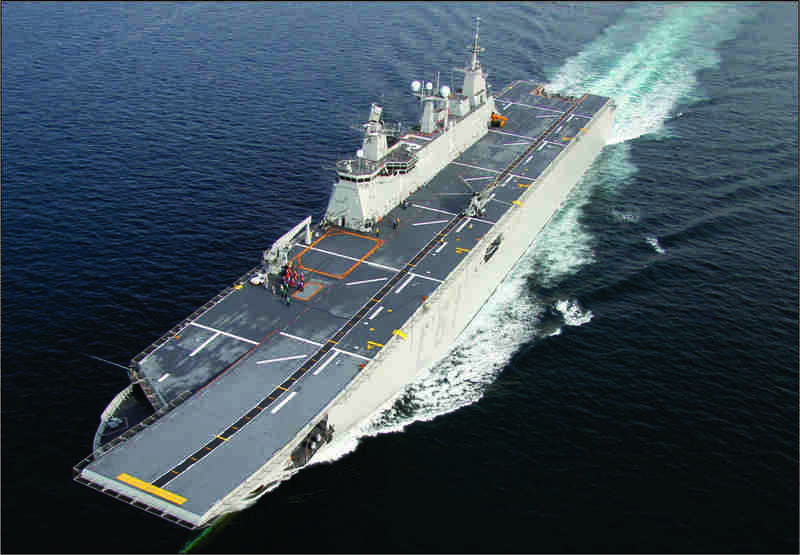 Navantia also has a contract for two similar LHD Ships in Australia, the "Canberra", already commissioned and the "Adelaide", to be commissioned in the last quarter of 2015. Lastly, this contract means the entrance of Navantia has been established in the Turkish market, where it has also opened an office in 2013 and is further involved in the Anti-Air Frigates programme, as well as the consolidation of Navantia as a reference in the LHD market. The Spanish Shipbuilder Navantia, is a world reference in the design, construction and integration of state-of-the-art Warships, as well as Ship Repairs & Modernisations. It is also engaged in the design and manufacture of Integrated Platform Management Systems, Fire Control Systems, Command and Control Systems, Propulsion Plants and through-life-support for all its products. Even though its main line of activity is in the Naval field, Navantia designs and manufactures systems for the Army and the Air Force as well. Navantia belongs to the SEPI Group, a corporate holding which is made up by 16 state-owned enterprises in which the State has a direct and majority participation. Moreover, SEPI has powers over the state-owned radio and television enterprise, Corporación Radio Televisión Española (RTVE), oversees a state-owned foundation, and has direct minority participations in a further ten enterprises, and indirect ones in more than one hundred companies.